Even if you put much effort into something, finally achieving a goal sometimes feels weird. 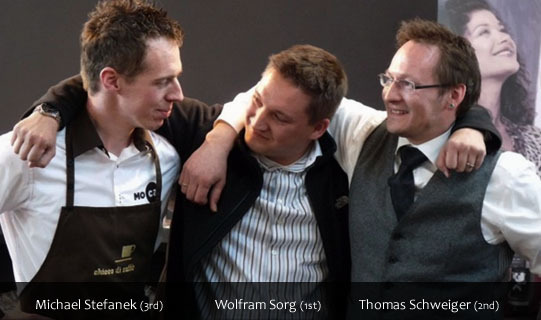 To make it short: I won the national German Barista Championship 2011 and will have the honor to represent Germany at the World Barista Championship in Bogota at the beginning of June. There is still a lot to do till then, many things to reconsider, to change, to adapt. But that is part of the game, and I like it. I will cover the competition in a separate post. For now I would like to give credits to those people who brought me to where I am now and who made the competition possible. Thomas Schweiger and Thomas Schiessl were a great support throughout the year and at the competition itself. We were working as a team always, helping each other, exchanging minds, all the support one needs. Again, like last year, Björn Dietrich was part of the show as well and was a great support. Thanks guys! Huge thanks to Thomas Kliefoth, our national coordinator, who managed to organize a great competition together with some help of the German Barista Guild and the many volunteers working hard throughout the days. Even the participants themselves joined in to help and all this work brought us even closer together in “building up our own competition”. Thanks to all of you, I always enjoy meeting you, you are a very good company. Finally, we have to mention the sponsors who gave what was needed to get the competition running. Astoria did a great job and was a major factor for the success of the event. For a full list of the sponsors please have a visit at the SCAE German Chapter web page. Hello, are there any videos of the presentations available? I can’t find anything. Unfortunately there are no videos available yet. There will be a DVD available in some weeks.